It all began with the installment of Iron Man movies. Who doesn't want to be cool, rich, smart, attractive, and powerful like Tony Stark aka Robert Downey Jr.? (If you're one of the rare few, please remain silent for the whole post. 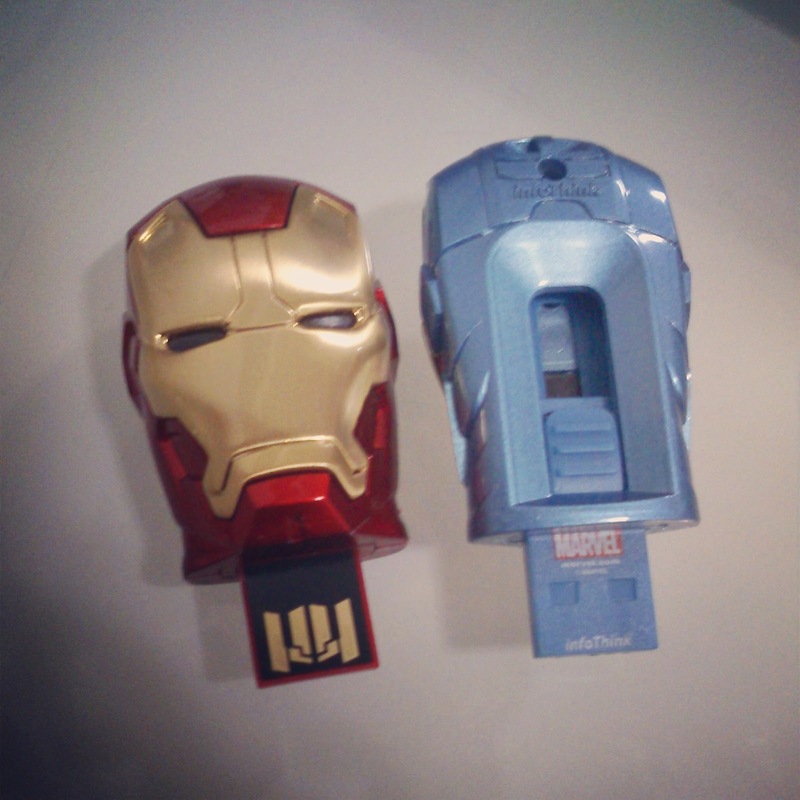 Thank you for your cooperation) So when the news about IRON MAN USB FLASH DRIVE was out, I just could not wait to get my hands on this product of high-quality. A year or two ago, I bought a MARK VI (8GB). 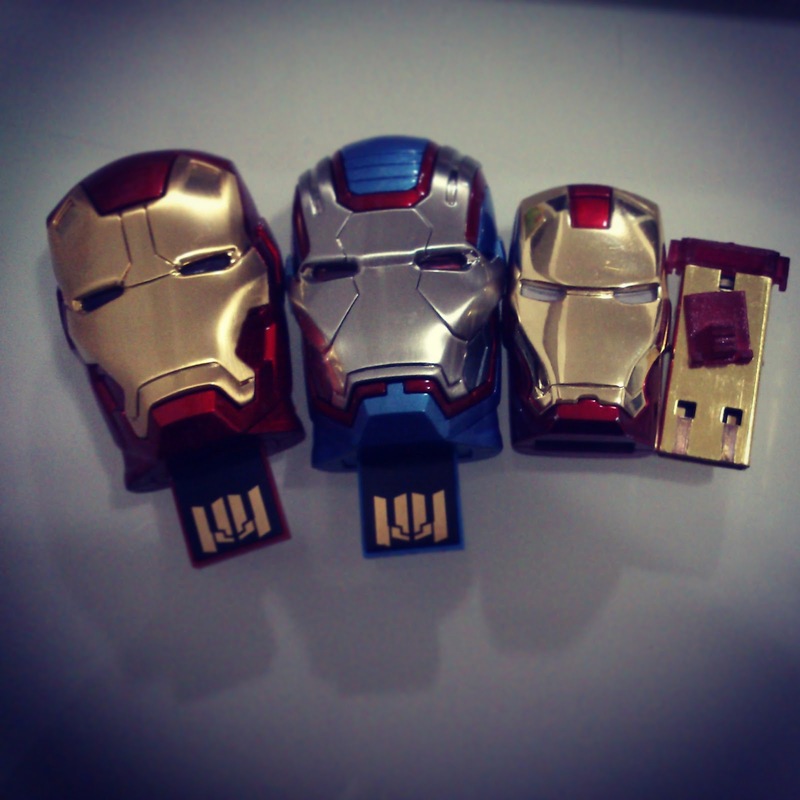 I was very satisfied with my usb for its cool appearance, especially the metallic paint, which was a very nice touch. However, good thing never lasts that long. The slider was broken (and for that, I thank my brother for his incessant pushing and pulling). While I was so busy sucking my own sorrow over my then-broken precious (YES, MY PRESUSSSSSSS), the news of a set of new IRON MAN USB came to me at exactly the time when I most needed some remedy. Almost with no hesitation, I bought two flash drives this time: IRON PATRIOT and MARK 42. Both purchases I was made with GrouponHK. Speaking of GrouponHK, I must say that I was pleased to use their service but something odd happened today. For the first time today I went to their newly open (I don't know when) pickup store in Causeway Bay. As soon as I got a ticket, it did not take long to have my number called out. I reached the designated desk and the staff went away with my receipts to find my 2 new babies. Here it is, the weird thing. The staff came with one MARK 42 (16GB), and, one WAR MACHINE (16GB). WHAT? 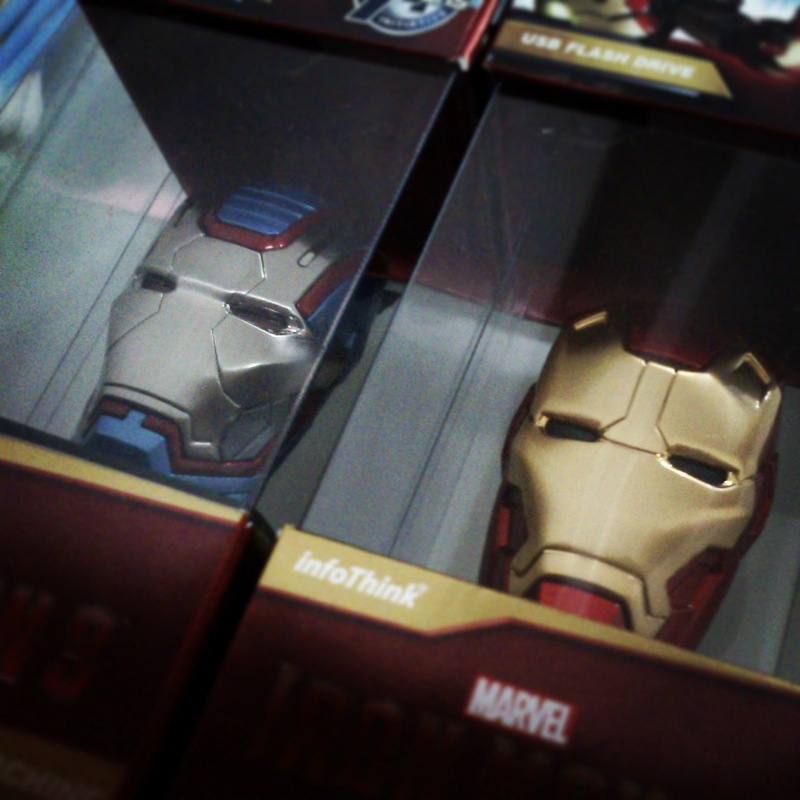 I bought an IRON PATRIOT and you gave me a WAR MACHINE? For a second I thought maybe I could just take the WAR MACHINE because in the movie, he is on the good side. How embarrassed is that I thought IRON PATRIOT was the good one, too...Plus I did not (still don't) like WAR MACHINE's red eye blinking while it is plugged into a computer. I told the staff that there must have been a mistake because that was not what I ordered. Soon the staff came with the right one. One more odd thing happened after I unboxed my new babies, I will come to that later. The new ones are larger than the previous generation. This time around, the flash drives are bigger than the previous generation. Let me put it like this: my MARK VI's face is wide like a thumb, while both my MARK 42 and IRON PATRIOT can be as wide as two thumbs put together. The improvement of the new flash drives would be the design of the slider, but I am not certain about it. At least they look different now. The old one could easily be broken by careless hands because the end of the slider was so thin and could break off with a bit effort and force. The slider on the new flash drive is bigger, and it looks as if it is less likely to break. Besides, when the usb plate (or whatever it is called) was pushed to emerge from the inside, it looked thinner than the old one. It gave me a worrying thought of whether it would break easily if someone (yeah, that someone would be me) accidentally had a direct contact with the product while it was functioning. The new flash drives are still very light though increased in size. They look more like a little display because they are more noticeable with their size. Also, the metallic surface on the new one is different than the old one, the old one is clear like a mirror, while the new one cannot reflect well. But I do like the new one because I when I take a photo with my new babies they do not reflect like a mirror and I do not have to get myself to move a lot to get the right angle, which happened to be the case when I tried to take a photo of my MARK VI, it was a bit upsetting that it was hard to get the right angle so that its "face" looked clear and nothing was in it. The only thing I am not happy with was the absence of a bottle container to store the usb. I only have the packaging boxes to store the usb. Meanwhile, I guess I am going to keep the box, though it will soon prove itself to be a burden in face of frequent usage. So, the box, right, the second and last odd thing has to do with the box. 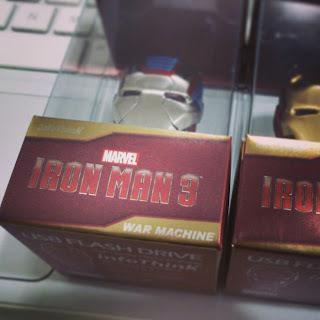 Remember when I talked about the staff giving me WAR MACHINE and said it was an IRON PATRIOT? It turned out that the mistake was made because the packaging was done incorrectly. The box contained my IRON PATRIOT stated that it was a WAR MACHINE. ODD. I even went online to reassure myself that I had bought the right one. The whole thing was so confusing. Now I see why the staff thought she had got the correct usb for me. I wonder if other customers got the wrong one as well. If so, I hope that it would not be too late until they have found that out. While it is EASY to plug the new ones into a PC, it is VERY DIFFICULT to plug them into a notebook. When I tried to plug one into my notebook, the slider was simply not strong enough and it fell back inside. I had to hold up one side of my notebook and tried hard to plug the usb in. I had another try and I had to be very careful in order to have the flash drives successfully plugged into my notebook. I am seriously not happy with the new design because of the weak slider. I hope to see an improvement shown in the future products.